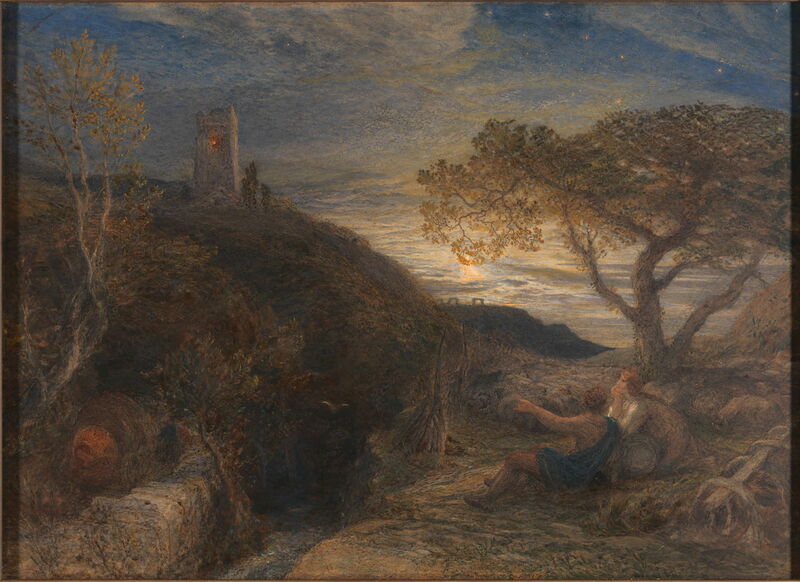 Samuel Palmer (1805–1881), The Lonely Tower (1868), watercolor, gouache and gum arabic on London board: a high-quality pasteboard sheet made of Whatman's finest drawing paper, 51.4 x 70.8 cm, Yale Center for British Art, New Haven, CT. Wikimedia Commons. By the early 1850s, just after the death of JMW Turner, Samuel Palmer’s paintings had lost his earlier vision, and he was accomplishing more in his etchings than in paint. Samuel Palmer (1805–1881), The Sleeping Shepherd; Early Morning (1857), etching, hand-colored with watercolor and opaque white with gold highlights, 9.5 x 7.8 cm, The National Gallery of Art (Rosenwald Collection), Washington, DC. Courtesy of The National Gallery of Art. 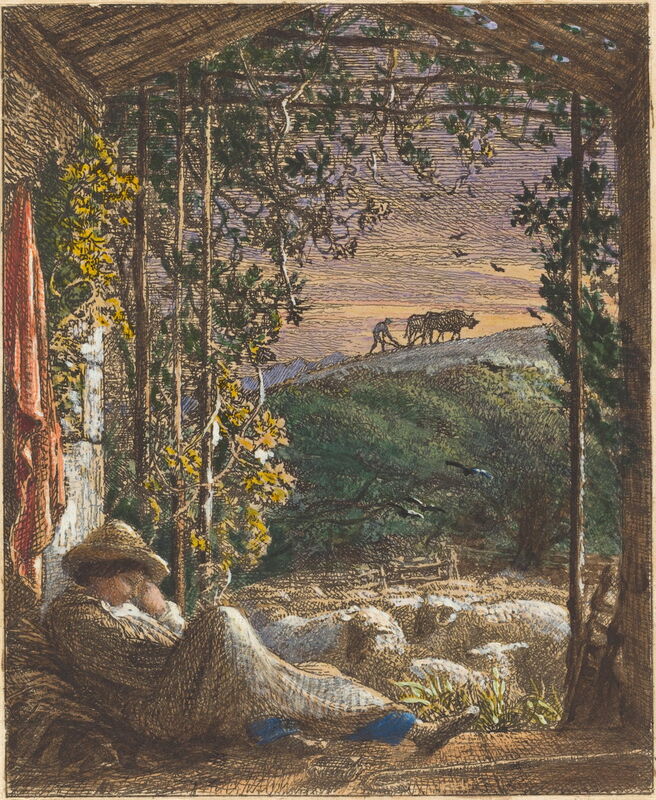 In his The Sleeping Shepherd; Early Morning (1857), Palmer has followed Blake’s practice of making a print, then painting it by hand, using watercolour, opaque white gouache and gold for the highlights. Its simple motif, of a shepherd asleep with his flock, and a distant team ploughing in silhouette, holds some of the magic of his Shoreham years. Rustic Contentment (date not known) is a more typical watercolor of this time, though: pleasant, well-painted, but sadly rather hackneyed. 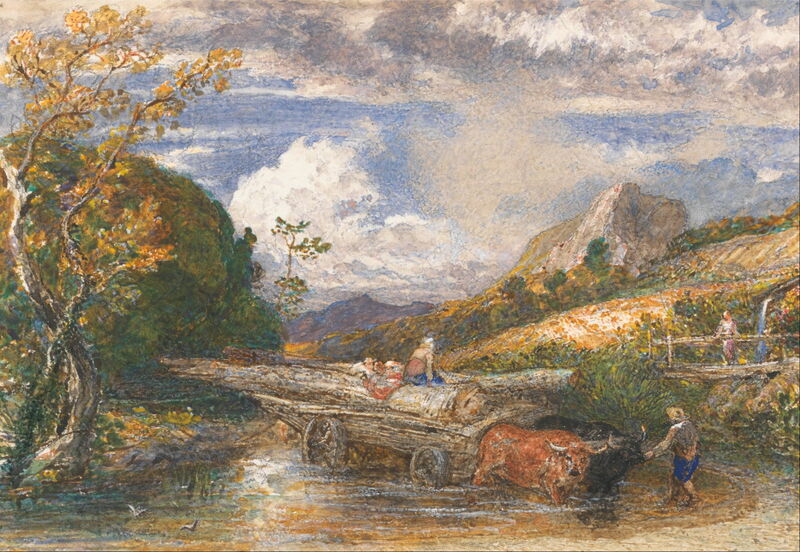 Samuel Palmer (1805–1881), Timber Wagon crossing a Stream (date not known), watercolor and gouache on thick, slightly textured, cream wove paper, 10.5 x 15.2 cm, Yale Center for British Art, New Haven, CT. Wikimedia Commons. Also undated is his watercolour of a Timber Wagon crossing a Stream, in a similar vein. Then in 1861, Palmer’s world was turned upside down when his older son, Thomas More Palmer, died. The family moved from Kensington, eventually settling in a villa not far from John Linnell, his father-in-law, at Redhill, Surrey. Palmer lived and worked in seclusion at one end, his family at the other. His father-in-law had to step in and buy the Palmers’ house in the end, something that was only made possible by Linnell’s unexpected commercial success. Palmer, like Linnell, then resorted to painting watercolour sunsets and nocturnes, and some of his Shoreham vision returned at last. 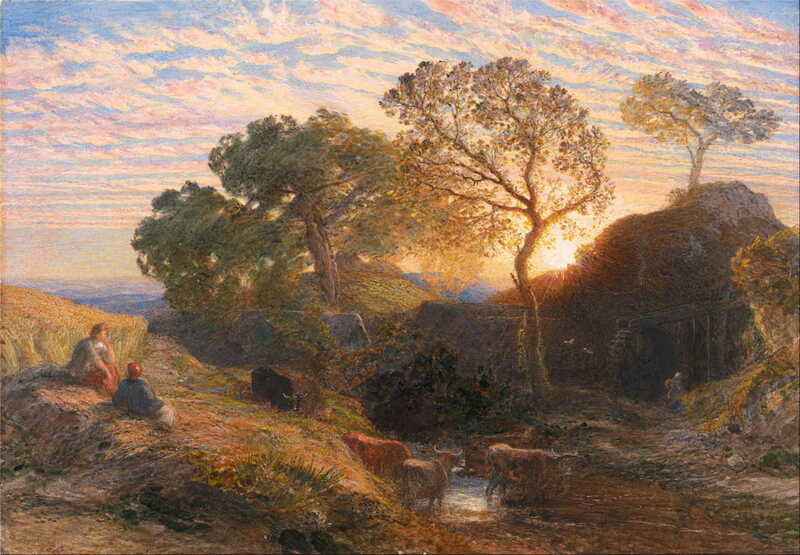 Palmer’s Sunset (1861) is among the best of these, capturing the warm sunlight of the late summer, just before the grain harvest, with an overshot watermill and a small crag behind. Samuel Palmer (1805–1881), Tintern Abbey at Sunset (1861), watercolor, gouache and varnish over graphite with scratching out on heavy card, 33.3 x 70.5 cm, Yale Center for British Art, New Haven, CT. Wikimedia Commons. Tintern Abbey at Sunset (1861) rearranges the same rustic elements beside the ruins of Tintern Abbey, which had for more than a century attracted the best topographic artists. Palmer also became concerned at what he considered to be the “degraded materialism which is destroying art”. He started to collect a display of art which he felt would express his protest against that. Inspired again by Blake, he embarked on a long project to illustrate Milton in etchings, which he completed shortly before his death, and started work on Virgil’s pastoral poem, the Eclogues. He first translated it from Latin, then etched illustrations, a project which he never completed. 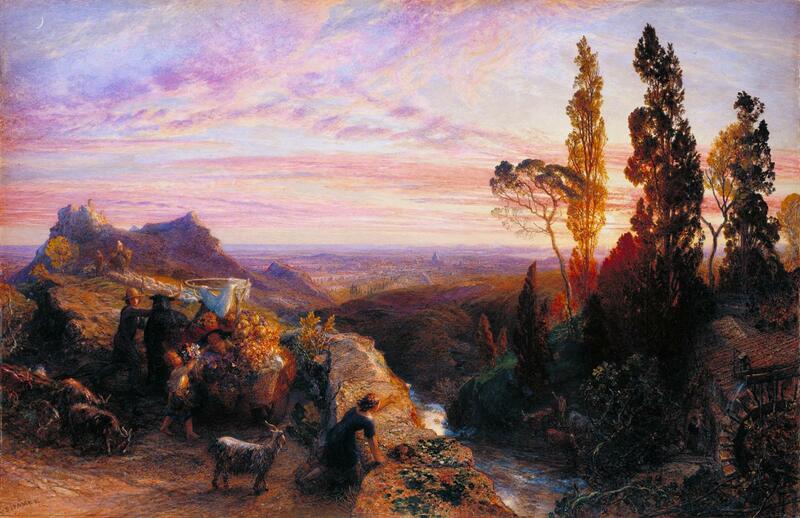 A Dream in the Apennine (1864) must have been painted from sketches which he had made during his extended honeymoon in Italy. When he exhibited it in the same year, its note read: Suddenly, at a turn in the mountain road, we looked for the first time on that Plain; the dispenser of law, the refuge of philosophy, the cradle of faith. Ground which Virgil trod and Claude invested with supernatural beauty was sketched – but with a trembling pencil. It shows Rome in the distance, viewed from the south east. Samuel Palmer (1805–1881), The Lonely Tower (1868), watercolor, gouache and gum arabic on London board: a high-quality pasteboard sheet made of Whatman’s finest drawing paper, 51.4 x 70.8 cm, Yale Center for British Art, New Haven, CT. Wikimedia Commons. A recurring theme which appears in many of his later paintings and etchings is that of an isolated tower, as shown in this watercolour of The Lonely Tower from 1868. A decade later he made one of his finest etchings, The Lonely Tower (1879), of a similar motif, and at the time of his death, he was reportedly working on watercolour versions of that and of another of his best etchings, The Bellman (1879). Another of his late and more visionary paintings is the panoramic dusk view of Old England’s Sunday Evening (1874). Unusually, this takes us to coastal grain fields by a lonely church, as the local women and children are arriving for what must be a late service on a Sunday evening. Judging by its rocky and quite rugged coastline, this landscape cannot be in the south east of England, but looks to have been based on much earlier sketches made on the coast of Devon or Cornwall. Samuel Palmer (1805–1881), The Winding Stream (c 1879), watercolour on paper, 10.2 x 17.8 cm, The Victoria and Albert Museum, London. Courtesy of and © Victoria and Albert Museum, London. 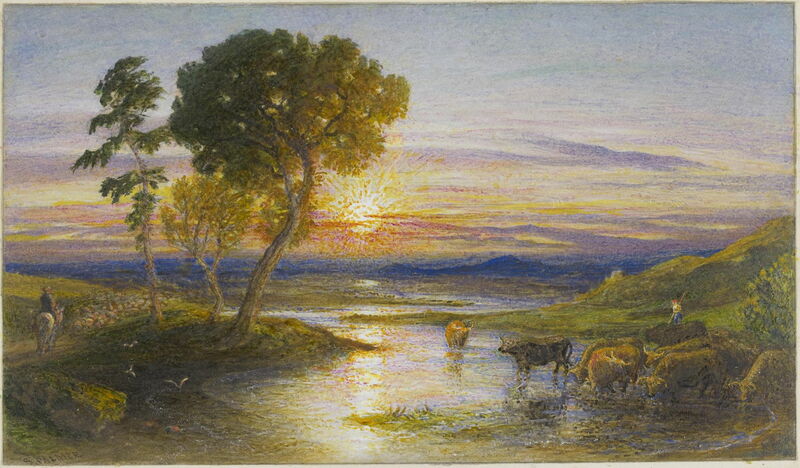 Palmer’s sun continued to set in the watercolours of his last couple of years, as shown in The Winding Stream (c 1879), painted as Impressionism was reaching its height in France. Palmer died on 24 May 1881; the following January his father-in-law John Linnell died. They and their works were quickly forgotten, and were not rediscovered until the 1950s. Posted in General, Painting and tagged Ancients, Blake, etching, landscape, Linnell, painting, Palmer, Turner. Bookmark the permalink.